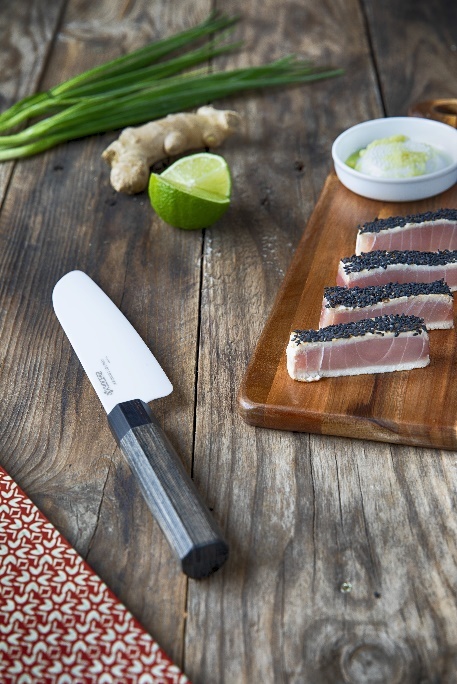 Costa Mesa, Calif. – December 6, 2018 – Combining the high performance of zirconia ceramic blades with the beauty and serenity inspired by Japan’s Fuji Sanctuary, Kyocera has created a new line of Fuji Ceramic Knives just in time for the holidays. Innovative, durable and beautiful, the Fuji series’ design is a harmonious blend of traditional and modern — featuring a weathered brown, handmade pakkawood handle and Kyocera’s proprietary ultra-sharp zirconia ceramic blade that will maintain its sharpness up to 10x longer than metal knives. Located at the foot of Mount Fuji in Japan, the Fuji Sanctuary is a spiritual place for people of all faiths, nationalities and backgrounds to come together and pray for a more peaceful world with flags from around the globe and peace poles for each country. It has been described as “filled with the energy of love, light, and harmony” and was the inspiration for the design of the new Fuji series. The hand-crafted blade with double-sided edge beveling is made in Japan and ideal for slicing boneless meats and vegetables. Lightweight and easy to clean, Kyocera’s ceramic blades are rust-proof, non-reactive to acids and flavors, and won’t brown food. Pakkawood is better suited to withstand moisture than standard wood and won’t shrink, expand or crack after repeated use, delivering durability without sacrificing the beauty of a natural wood. The pakkawood handle provides perfect balance and control and elegantly contrasts the white blade, making it a great addition to any home cook or chef’s collection. Kyocera was one of the first companies in the world to begin manufacturing and selling kitchen knives with blades made from fine ceramics. Since 1984, Kyocera has been continually enhancing the material technology and design of its ceramic knives, developing its product range with various colors and styles and converting customers around the world to fans of ceramic kitchen tools. Recently the popularity of Kyocera’s knives has been growing even more rapidly, with total shipments surpassing over 10 million units. Kyocera Corporation (TOKYO:6971) (https://global.kyocera.com) the parent and global headquarters of the Kyocera Group, was founded in 1959 as a producer of fine ceramics (also known as “advanced ceramics”). By combining these engineered materials with metals and integrating them with other technologies, Kyocera has become a leading supplier of ceramic cutlery, industrial and automotive components, semiconductor packages, electronic devices, solar power generating systems, printers, copiers, and mobile phones. During the year ended March 31, 2018, the company’s net sales totaled 1.58 trillion yen (approx. 14.9 billion USD). Kyocera appears on the latest listing of the “Top 100 Global Innovators” by Clarivate Analytics, and is ranked #612 on Forbes magazine’s 2018 “Global 2000” list of the world’s largest publicly traded companies.